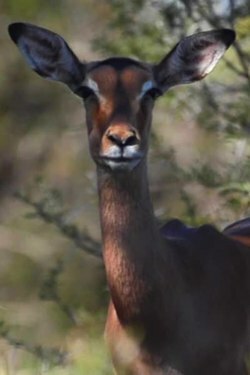 An impala swallowing and then regurgitating food – a behaviour known as "chewing the cud"
Ruminants are mammals that are able to acquire nutrients from plant-based food by fermenting it in a specialized stomach prior to digestion, principally through microbial actions. The process, which takes place in the front part of the digestive system and therefore is called foregut fermentation, typically requires the fermented ingesta (known as cud) to be regurgitated and chewed again. The process of rechewing the cud to further break down plant matter and stimulate digestion is called rumination. The word "ruminant" comes from the Latin ruminare, which means "to chew over again". The roughly 200 species of living ruminants include both domestic and wild species. Ruminating mammals include cattle, all domesticated and wild bovines, goats, sheep, giraffes, deer, gazelles, and antelopes. It has also been suggested that notoungulates also relied on rumination, as opposed to other atlantogenates that rely on the more typical hindgut fermentation, though this is not entirely certain. Taxonomically, the suborder Ruminantia (also known as ruminants) is a lineage of herbivorous artiodactyls that includes the most advanced and widespread of the world's ungulates. The term 'ruminant' is not synonymous with Ruminantia. The suborder Ruminantia includes many ruminant species, but does not include tylopods and marsupials. The suborder Ruminantia includes six different families: Tragulidae, Giraffidae, Antilocapridae, Moschidae, Cervidae, and Bovidae. The first two chambers are the rumen and the reticulum. These two compartments make up the fermentation vat, they are the major site of microbial activity. Fermentation is crucial to digestion because it breaks down complex carbohydrates, such as cellulose, and enables the animal to utilize them. Microbes function best in a warm, moist, anaerobic environment with a temperature range of 37.7 to 42.2 °C (100 to 108 °F) and a pH between 6.0 and 6.4. Without the help of microbes, ruminants would not be able to utilize nutrients from forages. The food is mixed with saliva and separates into layers of solid and liquid material. Solids clump together to form the cud or bolus. The cud is then regurgitated and chewed to completely mix it with saliva and to break down the particle size. Smaller particle size allows for increased nutrient absorption. Fiber, especially cellulose and hemicellulose, is primarily broken down in these chambers by microbes (mostly bacteria, as well as some protozoa, fungi, and yeast) into the three volatile fatty acids (VFAs): acetic acid, propionic acid, and butyric acid. Protein and nonstructural carbohydrate (pectin, sugars, and starches) are also fermented. Saliva is very important because it provides liquid for the microbial population, recirculates nitrogen and minerals, and acts as a buffer for the rumen pH. The type of feed the animal consumes affects the amount of saliva that is produced. Though the rumen and reticulum have different names, they have very similar tissue layers and textures, making it difficult to visually separate them. They also perform similar tasks. Together, these chambers are called the reticulorumen. The degraded digesta, which is now in the lower liquid part of the reticulorumen, then passes into the next chamber, the omasum. This chamber controls what is able to pass into the abomasum. It keeps the particle size as small as possible in order to pass into the abomasum. The omasum also absorbs volatile fatty acids and ammonia. After this, the digesta is moved to the true stomach, the abomasum. This is the gastric compartment of the ruminant stomach. 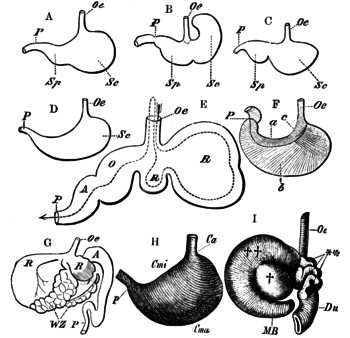 The abomasum is the direct equivalent of the monogastric stomach, and digesta is digested here in much the same way. This compartment releases acids and enzymes that further digest the material passing through. This is also where the ruminant digests the microbes produced in the rumen. Digesta is finally moved into the small intestine, where the digestion and absorption of nutrients occurs. The small intestine is the main site of nutrient absorption. the surface area of the digesta is greatly increased here because of the villi that are in the small intestine. This increased surface area allows for greater nutrient absorption. Microbes produced in the reticulorumen are also digested in the small intestine. After the small intestine is the large intestine. The major roles here are breaking down mainly fiber by fermentation with microbes, absorption of water (ions and minerals) and other fermented products, and also expelling waste. Fermentation continues in the large intestine in the same way as in the reticulorumen. Only small amounts of glucose are absorbed from dietary carbohydrates. Most dietary carbohydrates are fermented into VFAs in the rumen. The glucose needed as energy for the brain and for lactose and milk fat in milk production, as well as other uses, comes from nonsugar sources, such as the VFA propionate, glycerol, lactate, and protein. The VFA propionate is used for around 70% of the glucose and glycogen produced and protein for another 20% (50% under starvation conditions). 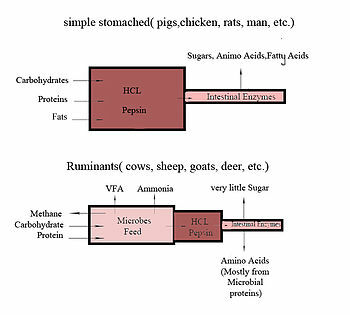 Hofmann and Stewart divided ruminants into three major categories based on their feed type and feeding habits: concentrate selectors, intermediate types, and grass/roughage eaters, with the assumption that feeding habits in ruminants cause morphological differences in their digestive systems, including salivary glands, rumen size, and rumen papillae. However, Woodall found that there is little correlation between the fiber content of a ruminant's diet and morphological characteristics, meaning that the categorical divisions of ruminants by Hofmann and Stewart warrant further research. Also, some mammals are pseudoruminants, which have a three-compartment stomach instead of four like ruminants. The Hippopotamidae (comprising hippopotami) are well-known examples. Pseudoruminants, like traditional ruminants, are foregut fermentors and most ruminate or chew cud. However, their anatomy and method of digestion differs significantly from that of a four-chambered ruminant. Monogastric herbivores, such as rhinoceroses, horses, and rabbits, are not ruminants, as they have a simple single-chambered stomach. These hindgut fermenters digest cellulose in an enlarged cecum through the reingestion of the cecotrope. Wild ruminants number at least 75 million and are native to all continents except Antarctica. Nearly 90% of all species are found in Eurasia and Africa. Species inhabit a wide range of climates (from tropic to arctic) and habitats (from open plains to forests). The population of domestic ruminants is greater than 3.5 billion, with cattle, sheep, and goats accounting for about 95% of the total population. Goats were domesticated in the Near East circa 8000 BC. Most other species were domesticated by 2500 BC., either in the Near East or southern Asia. Ruminating animals have various physiological features that enable them to survive in nature. One feature of ruminants is their continuously growing teeth. During grazing, the silica content in forage causes abrasion of the teeth. This abrasion is compensated for by continuous tooth growth throughout the ruminant's life, as opposed to humans or other nonruminants, whose teeth stop growing after a particular age. Most ruminants do not have upper incisors; instead, they have a thick dental pad to thoroughly chew plant-based food. Another feature of ruminants is the large ruminal storage capacity that gives them the ability to consume feed rapidly and complete the chewing process later. This is known as rumination, which consists of the regurgitation of feed, rechewing, resalivation, and reswallowing. Rumination reduces particle size, which enhances microbial function and allows the digesta to pass more easily through the digestive tract. Vertebrates lack the ability to hydrolyse the beta [1–4] glycosidic bond of plant cellulose due to the lack of the enzyme cellulase. Thus, ruminants must completely depend on the microbial flora, present in the rumen or hindgut, to digest cellulose. Digestion of food in the rumen is primarily carried out by the rumen microflora, which contains dense populations of several species of bacteria, protozoa, sometimes yeasts and other fungi – 1 ml of rumen is estimated to contain 10–50 billion bacteria and 1 million protozoa, as well as several yeasts and fungi. Since the environment inside a rumen is anaerobic, most of these microbial species are obligate or facultative anaerobes that can decompose complex plant material, such as cellulose, hemicellulose, starch, and proteins. The hydrolysis of cellulose results in sugars, which are further fermented to acetate, lactate, propionate, butyrate, carbon dioxide, and methane. As bacteria conduct fermentation in the rumen, they consume about 10% of the carbon, 60% of the phosphorus, and 80% of the nitrogen that the ruminant ingests. To reclaim these nutrients, the ruminant then digests the bacteria in the abomasum. The enzyme lysozyme has adapted to facilitate digestion of bacteria in the ruminant abomasum. Pancreatic ribonuclease also degrades bacterial RNA in the ruminant small intestine as a source of nitrogen. During grazing, ruminants produce large amounts of saliva – estimates range from 100 to 150 litres of saliva per day for a cow. The role of saliva is to provide ample fluid for rumen fermentation and to act as a buffering agent. Rumen fermentation produces large amounts of organic acids, thus maintaining the appropriate pH of rumen fluids is a critical factor in rumen fermentation. After digesta pass through the rumen, the omasum absorbs excess fluid so that digestive enzymes and acid in the abomasum are not diluted. Tannins are phenolic compounds that are commonly found in plants. Found in the leaf, bud, seed, root, and stem tissues, tannins are widely distributed in many different species of plants. Tannins are separated into two classes: hydrolysable tannins and condensed tannins. Depending on their concentration and nature, either class can have adverse or beneficial effects. Tannins can be beneficial, having been shown to increase milk production, wool growth, ovulation rate, and lambing percentage, as well as reducing bloat risk and reducing internal parasite burdens. Tannins can be toxic to ruminants, in that they precipitate proteins, making them unavailable for digestion, and they inhibit the absorption of nutrients by reducing the populations of proteolytic rumen bacteria. Very high levels of tannin intake can produce toxicity that can even cause death. Animals that normally consume tannin-rich plants can develop defensive mechanisms against tannins, such as the strategic deployment of lipids and extracellular polysaccharides that have a high affinity to binding to tannins. Some ruminants (goats, deer, elk, moose) are able to consume feed high in tannins (leaves, twigs, bark) due to the presence in their saliva of tannin-binding proteins. The Law of Moses in the Bible only allowed the eating of mammals that had cloven hooves (i.e. members of the order Artiodactyla) and "that chew the cud", a stipulation preserved to this day in Jewish dietary laws. The verb 'to ruminate' has been extended metaphorically to mean to ponder thoughtfully or to meditate on some topic. Similarly, ideas may be 'chewed on' or 'digested'. 'Chew the (one's) cud' is to reflect or meditate. In psychology, "rumination" refers to a pattern of thinking, and is unrelated to digestive physiology. Methane is produced by a type of archaea, called methanogens, as described above within the rumen, and this methane is released to the atmosphere. The rumen is the major site of methane production in ruminants. Methane is a strong greenhouse gas with a global warming potential of 86 compared to CO2 over a 20-year period. In 2010, enteric fermentation accounted for 43% of the total greenhouse gas emissions from all agricultural activity in the world, 26% of the total greenhouse gas emissions from agricultural activity in the U.S., and 22% of the total U.S. methane emissions. The meat from domestically-raised ruminants has a higher carbon equivalent footprint than other meats or vegetarian sources of protein based on a global meta-analysis of lifecycle assessment studies. Methane production by meat animals, principally ruminants, is estimated 15–20% global production of methane, unless the animals were hunted in the wild. However, the current U.S. domestic beef and dairy cattle population is around 90 million head, which is not much different from the peak wild population of American Bison that primarily roamed the part of North America that now makes up the U.S. This is estimated to have been over 60 million head in the 1700s and prior . In addition, EPA estimates suggest bison produce more methane per head than cattle, with modern feedlot beef cattle producing perhaps as low as half the methane of bison per head. Therefore, it is likely that the pre-industrialized North American wild bison herd released more total methane into the atmosphere than the current total domesticated herd of beef and dairy cattle. ^ "Rumination: The process of foregut fermentation". ^ "Ruminant Digestive System" (PDF). ^ a b c Fernández, Manuel Hernández; Vrba, Elisabeth S. (2005-05-01). "A complete estimate of the phylogenetic relationships in Ruminantia: a dated species-level supertree of the extant ruminants". Biological Reviews. 80 (2): 269–302. doi:10.1017/s1464793104006670. ISSN 1469-185X. ^ a b c Fowler, M.E. (2010). "Medicine and Surgery of Camelids", Ames, Iowa: Wiley-Blackwell. Chapter 1 General Biology and Evolution addresses the fact that camelids (including camels and llamas) are not ruminants, pseudo-ruminants, or modified ruminants. ^ "Suborder Ruminatia, the Ultimate Ungulate". ^ Russell, J. B. 2002. Rumen Microbiology and its role In Ruminant Nutrition. ^ a b c d e Rickard, Tony (2002). Dairy Grazing Manual. MU Extension, University of Missouri-Columbia. pp. 7–8. ^ "How do ruminants digest?". OpenLearn. The Open University. Retrieved 14 July 2016. ^ Ditchkoff, S. S. (2000). "A decade since "diversification of ruminants": has our knowledge improved?" (PDF). Oecologia. 125 (1): 82–84. Bibcode:2000Oecol.125...82D. doi:10.1007/PL00008894. PMID 28308225. Archived from the original (PDF) on 2011-07-16. ^ Woodall, P. F. (1992-06-01). "An evaluation of a rapid method for estimating digestibility". African Journal of Ecology. 30 (2): 181–185. doi:10.1111/j.1365-2028.1992.tb00492.x. ISSN 1365-2028. ^ "Dental Anatomy of Ruminants". ^ "Fermentation Microbiology and Ecology". ^ Callewaert, L.; Michiels, C. W. (2010). "Lysozymes in the animal kingdom". Journal of Biosciences. 35 (1): 127–160. doi:10.1007/S12038-010-0015-5. ^ Irwin, D. M.; Prager, E. M.; Wilson, A. C. (1992). "Evolutionary genetics of ruminant lysozymes". Animal Genetics. 23 (3): 193–202. doi:10.1111/j.1365-2052.1992.tb00131.x. PMID 1503255. ^ Jermann, T. M.; Opitz, J. G.; Stackhouse, J.; Benner, S. A. (1995). "Reconstructing the evolutionary history of the artiodactyl ribonuclease superfamily". Nature. 374 (6517): 57–59. Bibcode:1995Natur.374...57J. doi:10.1038/374057a0. PMID 7532788. ^ Reid, J.T. ; Huffman, C.F. (1949). "Some physical and chemical properties of Bovine saliva which may affect rumen digestion and synthesis". Journal of Dairy Science. 32 (2): 123–132. doi:10.3168/jds.s0022-0302(49)92019-6. ^ "Rumen Physiology and Rumination". ^ Clauss, M.; Rossner, G. E. (2014). "Old world ruminant morphophysiology, life history, and fossil record: exploring key innovations of a diversification sequence" (PDF). Annales Zoologici Fennici. 51 (1–2): 80–94. doi:10.5735/086.051.0210. ^ "Cornell University Department of Animal Science". ^ Food and Agriculture Organization of the United Nations (2013) "FAO STATISTICAL YEARBOOK 2013 World Food and Agriculture". See data in Table 49. ^ Ripple, William J.; Pete Smith; Helmut Haberl; Stephen A. Montzka; Clive McAlpine & Douglas H. Boucher. 2014. "Ruminants, climate change and climate policy". Nature Climate Change. Volume 4 No. 1. P 2-5. ^ Cicerone, R. J., and R. S. Oremland. 1988 "Biogeochemical Aspects of Atmospheric Methane"
^ Yavitt, J. B. 1992. Methane, biogeochemical cycle. Pages 197–207 in Encyclopedia of Earth System Science, Vol. 3. Acad.Press, London, England. ^ Bureau of Sport Fisheries and Wildlife (January 1965). "The American Buffalo". Conservation Note. 12. Wikisource has the text of the 1905 New International Encyclopedia article Ruminant.